In warmer climates like in Central Texas, patios are extensions of our interior living spaces, often times used for dining, other types of outdoor home entertaining or to simply to relax in our free time. 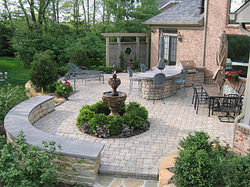 Walkways and Retaining walls add beauty and functionality to your front or backyard. Now days you can choose from a broad selection of colors and textures that go beyond railroad ties, rock, metal, blocks, and poured concrete. A well-built walkway and/or retaining wall will give your grounds the personal customized look that your friends and neighbors will desire. A garden pond is a beautiful and calming feature to have, however, ponds are living ecosystems that require maintenance, service, balancing and attention in order to thrive and grow properly. If you already own a fountain and/or know the type of pond you would like, MannyScapes can help you install, build or maintain it at a reasonable cost. 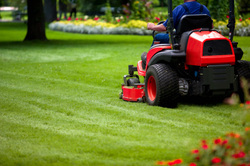 We can provide weekly or bi-weekly lawn service to your property. Customized garden service to include but not limited to planting, weeding, fertilizing, mulching and watering. Most often, sprinkler heads are damaged during the mowing of your lawn; when in need of basic repairs on your sprinkler heads or system please call MannyScapes. Many times, we are able to come right away because we understand the importance and the consequences if the problem is not addressed timely. If the damage is extensive, we will be honest and refer you to an experienced and licensed irrigation specialist.